When Zain Rais asked Hyderabad resident Shireen for her hand in marriage, she didn't exactly jump with joy. The move to a megalopolis such as Mumbai was daunting for the twenty-something, born and bred in the genteel environs of an old haveli and a huge family. "She didn't know anything about Mumbai and she was very, very nervous," Zain says. He decided to put her fears to rest with the help of a Bollywood, Rajshri brothers-style video film, starring all his friends and some of his family. "The motif was ‘If Zain troubles you, we will …'. My parents were in it too. It was like a tour of the joys Mumbai has in store, paired with the fact that she would always have all my friends and family to help and support her." The film was premiered at his sangeet function in Hyderabad and was an instant hit. "Shireen had tears in her eyes," Rais recalls. If you have always felt your life is the kind of stuff Bollywood blockbusters are made of, look no further than Your Life on Film, a quirky initiative by Mumbai-based filmmaker Rohan Sabharwal. The London Film School-trained director will create a specially crafted film for you, complete with songs, dance and melodrama, centred on your life, Bollywood-style. It is an idea that has found many takers — from people who have worked with Indian Railways for 25 years, national volleyball players, aspiring stand-up comedians from the Gulf, singers, college students, an Indo-Australian actress and separated lovers. Some, such as Dubai-based stand-up comedian Adnan Nalwala, choose to keep the focus on themselves. "The film I got made was like a showreel," says the 30-year-old, who will be performing in Mumbai in December. Nalwala has also got another short film made on a character from his routine called Jamshed. "Wham Bam Thank You Jam is a seven-minute film about a guy who thinks he's a player but is a loser." Unsurprisingly, the top billing for occasions when it seems nothing says it like a film comes from reconciliations and romances — just like the typical Bollywood formula. In fact, Bollywood could probably borrow some of the plots. Like the film college student Namita Kapoor (name changed) got made about her abusive boyfriend. A drug addict, he often harassed her and even followed her to her hometown, Delhi. Through the film, she could look at her life objectively. "We discussed how to do the film and finally decided to make the film funny and humorous so she could laugh off the whole episode. It was like a release for her," Sabharwal says. Another interesting story was made into the film An Epilogue to Friendship, where a girl has a fight with her friend and wants to make up for it. The story came from 23-year-old Danika Rodrigues. "It's about two best friends — one is not as pretty as the other and grows up in the shadow of the other girl," Rodrigues says. Fortunately, you don't need to belong to a film pedigree or have the backing of a Godfather-style producer to star in Your Life on Film. 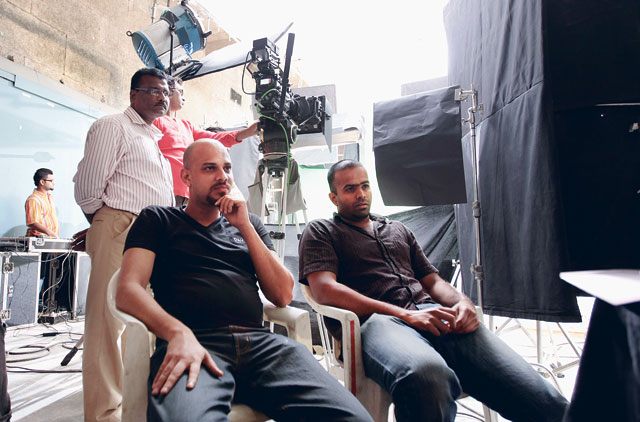 The cost for production starts from as low as Rs5,000 (Dh416), going upwards depending upon the length of the film. The films could be anywhere from five minutes to 30 minutes in length and can be in any style and form — with dialogue, with only music or completely silent. Clients can pick their genres — documentaries, music videos or short films. Of course, there is the chance of your story being rejected if it is not interesting enough. If you do have an interesting tale to tell, Sabharwal will help you write the script and also give you a short session on acting. His team includes a cinematographer, sound designer, director of photography and a music director. A film takes about a week or two to make, depending on how complex the subject is. Sabharwal plans to use some of the material, with permission from his clients, at leading international short film festivals. When he is not making films about other people's lives, 31-year-old Sabharwal runs his outfit Tenten Films, working on documentaries, feature shorts and ad films. He is also in the process of producing a feature-length documentary on the Jewish community in India, besides working as a graphics designer. Your Life On Film is something he does for fun. "It really excites me, because I get a glimpse into so many lives." What was the most interesting request for a film he has received so far? "It's one that is yet to be made — an ambulance driver from Chhatisgarh wanted a film made on his life and everything he has seen and experienced," Sabharwal says. "He has transported all kinds of people to the hospital and handled 2,000 emergency cases during his career." Word of this unique initiative has spread. And in a truly Bollywood twist to the plot, a magazine from New Zealand has contacted Sabharwal, asking him to make a short film on his own life. Even if you do not land a Bollywood-style role, you can get your face on a genuine, hand-drawn film poster. All you need to do is submit a photo and the film of your choice. Traditional Bollywood poster painters will draw you into a film poster — by hand, with no digital touch-ups. These unlettered (and till recently, unemployed) street painters are very much in demand today, thanks to the popularity of Bollywood poster art. If you run a Google search, you will get many links to "custom Bollywood film poster hand-painted by cinema hoarding". Poster artists have even made it to shows and workshops at London's Victoria & Albert Museum. There are also several outfits specialising in custom-made posters, such as the Mumbai-based Indian Hippy (www.hippy.in). Set up by 29-year-old Hinesh Jethwa, the painters of Indian Hippy have created posters for clients in Italy, the United States, the United Kingdom and Dubai. Prices start at Rs5,000 (Dh416). The time taken for each painting depends on factors such as the medium used, the surface, the size and, of course, the detailing required in the poster. "One of the most intricate is ‘Mughal-e-Azam' — it is also the most preferred film. I guess people find it exotic," Jethwani says. Again, much like a running motif, these posters are most in demand among lovers and couples about to get married. Customised posters have made it to French shores too. Limona Studio (www.limonastudio.com), headquartered in Paris, employs Mumbai-based film-hoarding painters. It was started in 2004 by two 39-year-old French women, Sophie Legoubin-Caupeil and Sarah Loosdregt-Charlet, both Indophiles. "We visit India often and really love Bollywood movies," Loosdregt-Charlet says. On one of their many trips to Mumbai, they met a poster artist and saw his work. It was love at first sight. Loosdregt-Charlet first got a poster made for friends and family. "It was a huge success. I decided to visit India to meet some painters." They recruited old poster artists from Alfred Talkies, the last remaining cinema to house a painting studio in Mumbai, and began Limona Studio. Their poster artists visit France every year for workshops. "People here get to see how they work — it's an art form, after all," she says. Limona Studio artists recently painted a 50x40 canvas for a popular dance festival in London. The posters are not inspired from only Hindi films — they use Bhojpuri and South Indian films as well. "Our clients like posters from Seventies and the Eighties. And they want the poster in a very exotic Bollywood-Indian style — with sarees and bindis, maharajas, big guy with moustache and gun and all that," Loosdregt-Charlet says. The bulk of their orders comes from Switzerland, England and the US. "We get a lot of families who want to have some fun with a quirky poster," she says. "They want to get everyone in the poster, including the pets." 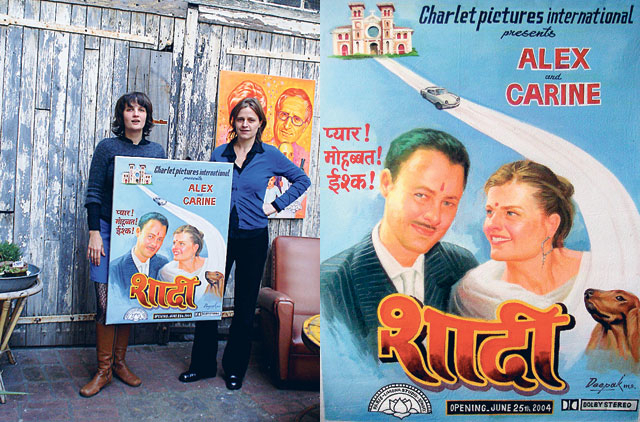 Their artists have painted a poster of ‘Zamaane Ko Dikhana Hai' for a French family and its pet dogs. The gun-toting trio of ‘Don' — Shah Rukh Khan, Priyanka Chopra and Isha Koppikar — have been replaced by a family where even the balding grandfather was holding a weapon. But of all the orders for posters, the request that made them smile came from a love-struck Frenchman. "He proposed to his partner with a poster from our studio," Loosdregt-Charlet grins. "And she accepted!"